This paper introduces a novel hybrid construction concept, namely Sparse Concrete Reinforcement In Meshworks (SCRIM), that intersects robot-based 3D Concrete Printing (3DCP) and textile reinforcement meshes to produce lightweight elements. In contrast to existing 3DCP approaches, which often stack material vertically, the SCRIM approach permits full exploitation of 6-axis robotic control by utilising supportive meshes to define 3D surfaces onto which concrete is selectively deposited at various orientation angles. Also, instead of fully encapsulating the textile in a cementitious matrix using formworks or spraying concrete, SCRIM relies on sparsely depositing concrete to achieve structural, tectonic and aesthetic design goals, minimising material use. 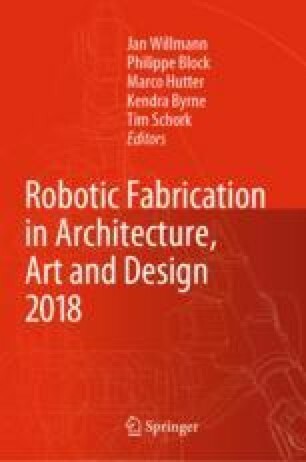 The motivation behind this novel concept is to fully engage the 3D control capabilities of conventional robotics in concrete use, offering an enriched spatial potential extending beyond extruded geometries prevalent in 3DCP, and diversifying the existing spectrum of digital construction approaches. The SCRIM concept is demonstrated through a small-scale proof-of-concept and a larger-scale experiment, described in this paper. Based on the results, we draw a critical review on the limitations and potentials of the approach. Danish Agency for Science and Higher Education for funding the project “3D Printet Byggeri” at the Danish Technological Institute. The authors gratefully acknowledge the assistance of Stian Vestly Holte, Kit Wai Chan, Alma Bangsgaard Svendsen and Suna Ezra Petersen, enrolled at the Master of Architecture programme CITAstudio: Computation in Architecture, KADK. The authors also wish to thank the anonymous reviewers for their comments and suggestions to improve the quality of the paper.